A 1 metre diameter willow wreath with lots of extra willow sprays – as big as a barn door! 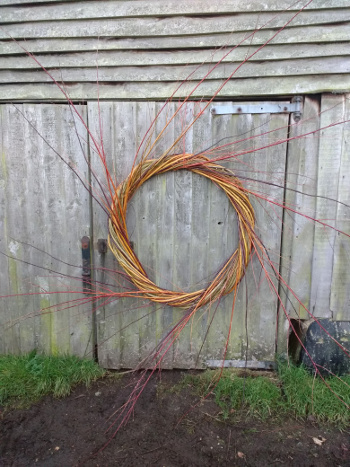 We’ve spent a lot of time recently cutting hazel in Bottoms’ Corner but just before Christmas were running a wreath making workshop at Jordan’s Mill near Biggleswade and needed some willow. At the same time we’d received a few orders for Christmas presents and decorations and that meant more willow. So the clearing saw had its first outing of the season. The bulk of our willow gets cut during January and February but a small sample brought in a month early always reminds me, very pleasantly, how beautiful it is. As usual, our willow is variable this year and as usual the best performers are different from previous years. This time around the Salix viminalis varieties are looking good but the purpureas are terrible – attacked through last summer by a jewel-like critter that we think is a poplar leaf beetle. But that’s another story. Getting my hands on some willow again was good. I needed to make some willow obelisks and a couple of monster wreaths and enjoyed the act of making. The willow is at its glossy best just after cutting and I used a fair amount of Cardinalis, a fabulous yellow and red, branched variety that reaches seven or eight feet in a good year. Like most yellows, in my experience, it’s difficult to work, fragile and prone to breaking, but it looks wonderful in a weave. Don’t even think about it for a basket border though. I often get asked to make things and have them couriered to distant parts of the UK, something that I do try to avoid if I can. However, the lure of these jobs meant I agreed to the wrapping, weighing, booking, hanging around for collection and on-line suspense waiting for news of delivery. We never feel able to charge the full cost of this process but it’s difficult to say no to customers and actually I do like seeing the things I make safely wrapped up and loaded onto a lorry. The huge wreaths I was excited to make. Something new is always worth pursuing. Agreeing to make a variation on an existing product, as was the case here, is easy when sat at a desk in the office, but it can be somewhat different from the reality of wrestling with a new project. Although I was confident I could make a pair of one metre diameter willow wreaths, the process was a fairly lengthy one, or at least it took me a while to produce something I was pleased with. In fact I was pretty happy with the pair I ended up with – multi-coloured, slightly wild and above all else – huge. And then of course they needed to be wrapped. A two person job involving significant quantities of tape, bubblewrap and clingfilm as well as liberal cursing. Unfortunately delivery was delayed for 24 hours. I’m now chasing the courier for a reason and hopefully compensation. That rather took the shine off my pleasure at getting what I thought were some pretty good things to a hopefully delighted but slightly impatient customer.